I think I am using the excuse of writing this blog post to procrastinate even longer on starting to quilt Downstream. I have a pretty darn clear vision of what I want for a large portion of the quilt, but to be honest, I’m a bit stumped on what to do in the darker (charcoal) areas. 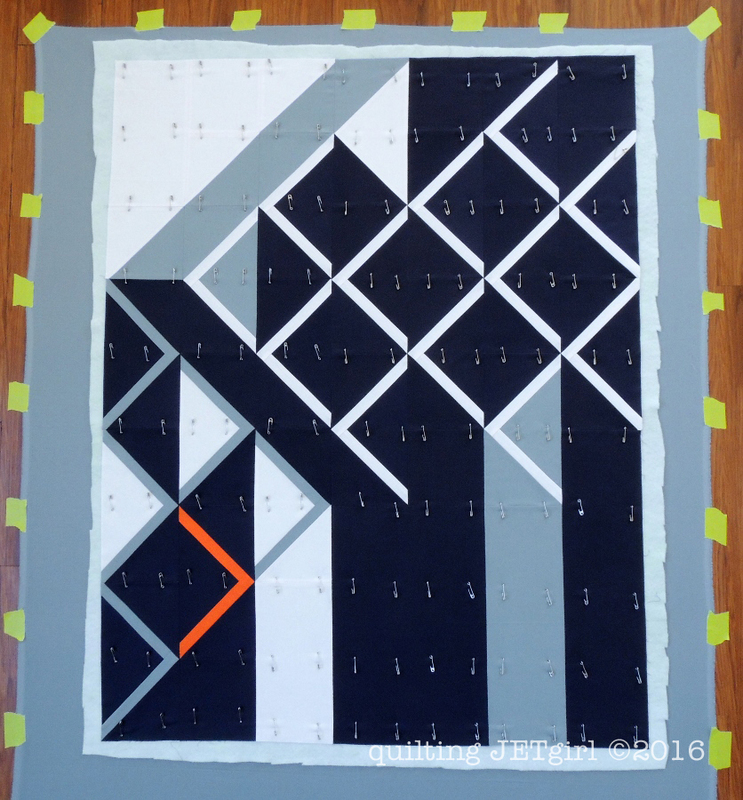 So, I’m sure I will have started on *something* (or rather, I hope I get up from writing this post and get started), but I am all ears for ideas on quilting the dark / charcoal. Enough preamble. Let’s see the quilt! I paper pieced the majority of the quilt top, and it finished at exactly 35.5-inches wide by 45.5-inches tall, just as it should. I had done the block piecing on retreat in Oregon with Renee, but I used my new Juki to piece the quilt top together. 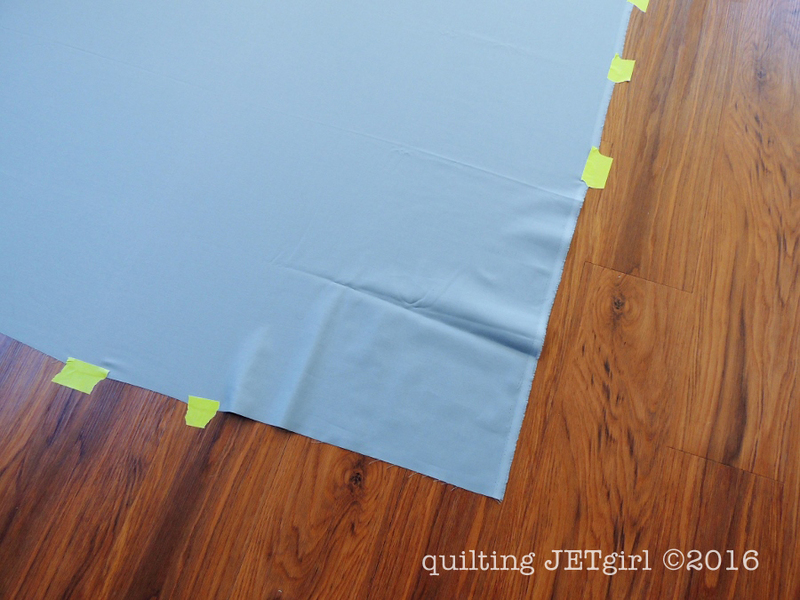 I plan to use the walking foot on my Juki to straight line quilt this quilt. I thought I’d give you a small view of how I prepare and baste my quilts that I sew on my domestic machine. I start by taping down my quilt backing (wrong side up). I start in the middle of the longest side, then go to the middle of the short side. Because this backing is longer than wide, I did a few pieces of tape at a time on the long side before moving to the shorter sides. At the end, I just need to add a few pieces to finish each corner. I do give the backing a very slight tug to pull out any wrinkles, and I wanted to show what an un-taped corner looks like. 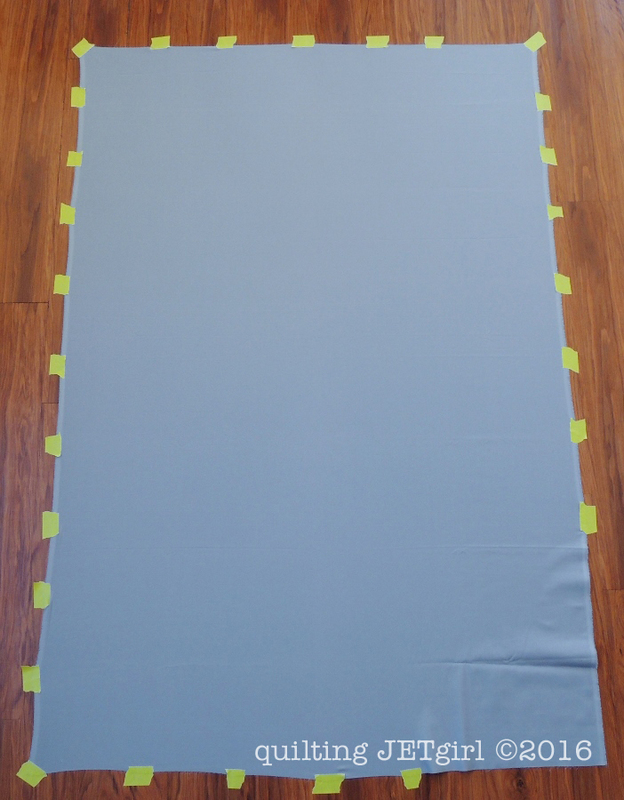 It doesn’t take much, and with a smooth quilt backing, I am confident that after I baste my quilt top the back will make it through the quilting process without tucks or wrinkles. One last thing to note: I use Scotch Masking Tape for “Hard to Stick Surfaces” that I buy at my local Home Depot (not an affiliate link). I have found that regular painter’s tape does not stick well enough as I move around and baste my quilt and the backing just springs up from being secured to the floor. Because this will be the first time I use my Juki to quilt (!! ), I made a quick quilt sandwich to try out the walking foot and get the settings for walking foot pressure and stitch length dialed in before starting to quilt Downstream. I did nothing other than slap fabric together (no basting), and I am so excited by the quality of the quilting and the results on the front and back. I am sure that Bernina’s are perfect machines for a lot of people, but my machine was not a good fit for me. I never saw stitches with this kind of consistency in length and fabric not pushed around even after lots of trying and samples and adjustments. I feel like with this one small sample, I’m ready to quilt without doing anything more than winding some bobbins! Here’s a sketch of the parts of the quilting that I know I want to do. The black lines are the areas/directions I plan to quilt, although I plan to use matching thread. The trick is figuring out what to do on the dark/charcoal areas because they need done first before I layer over top with the angled “downstream” quilting bits. I’m leaning toward horizontal lines in the background after having taken the time to mock this up. What would you do or suggest? Looks really interesting, I can see horizontal lines and zig zag chevrons too. Fun quilt Yvonne! Love the name too! I might consider something “eddy-like” in the grid of squares…if you wanted to add something curly to the straight line mix…just throwing it out there…I am a straight line girl by necessity, so whatever you go with will be great, I’m sure! Have fun!! Maybe some straight line spiral in the charcoal squares. Hope that makes sense. Lovely top. I say something totally unexpected, like a curvy motif. It would really contrast all the angles and stick out. Good luck! I am sure whatever you do will be interesting! Yvonne it looks beautiful. Can’t wait to see what you do in the grey areas. Did you design this yourself? It certainly hit the WOW factor in a nanno-second for me! I love the graphic design, the asymmetrical aspect, the quilting lines crossing for added interest…it is just amazing! Do you make and sell patterns? Love the strong graphic elements! Since everything is so linear, what about pebbles in the charcoal for some texture contrast? Your vision from the picture is perfection! You did a fantastic job on this and I know you will come up with the right quilting solution! Gorgeous! Love this. Before I got to your last photo, I was going to suggest emphasizing that orange bit (maybe an echo?) but I love what you’re planning. Thanks for the tip about the tape! I just love this design. It truly has movement. Your new machine sews beautifully! Quite impressive, actually. I’m headed to Home Depot today and will get some tape–it’s 60 miles from my house, so I don’t go often, but my husband needs something so off I go. Your quilt is stunning. 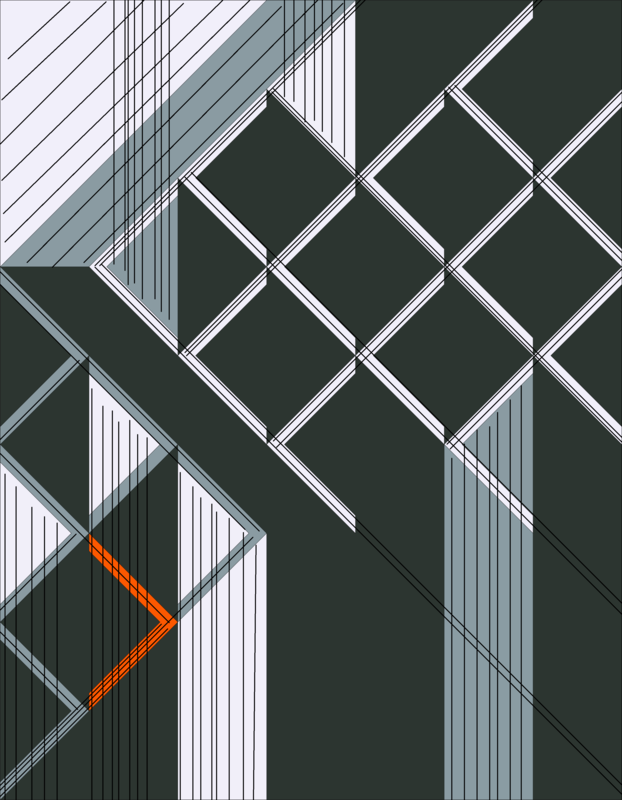 I really like keeping the straight lines–perhaps more directions, but it’s just my preference. The pebble quilting would add interest, but I still lean to the lines. Striking quilt! I like most of what you have in mind for quilting, though I think I would not quilt lines in the narrow white lines that make up the squares. Instead, use those white areas as boundaries and echo squares in those squares. Where the open squares are (two lower right, two upper right), have the lines flow in (horizontally), echo around, and flow back out (horizontally). Make sense? I’m sure though, that however you quilt it will be lovely! It is kind of nice knowing you procrastinate at times. 🙂 My suggestion is to do what you know and hope for inspiration along the way. I’m feeling a bit like a cheerleader because I was so excited to see this quilt in my feed. It’s great that you are at the quilting stage and I’m guessing you’ve started now. I’m for sticking with straight lines. Looks great Yvonne, can’t wait to see what you decide on and how it looks quilted! I love this design and the straight line quilting is going to compliment it so well. I’m glad the Juki is working beautifully for you! I think diagonal lines going from left to right might work. I am happy that you found the machine you like. I have a question that has nothing to do with current post. Have you done a quilt with top and bottom thread different color? Does the bottom thread show up a little on top? Thank you for your help. I am going to be no help to you whatsoever on the quilting suggestions. But I’m so happy for you with your new Juki. I can’t even imagine all the hassles that you had with your other machine that even something like walking foot quilting would be cause for concern. Something must have been seriously wrong with it. Glad you’ve finally moved on and to a better machine. Can’t wait to see this project finished. This a stunningly beautiful design. So much so that overly complicated free form quilting would I think just distract so its straight lines for me! Look forward to seeing it finished. Hope this is QuiltCon bound…..
Ohhh this is so fun to look at! You’ve really done a great job. I like what you’ve got going with the current quilting idea. You’ve got so many great suggestions so far so I have no idea if mine is going to help at all. I’m a fan of diagonal lines and what I’m going to call ghosting, because I don’t know the right terminology for it. I take a design shape I like from the quilt and place it in another location, for example a Lonestar quilt when broken down has a diamond shape, so I’ll mark some big and some small diamond shapes in the background either randomly or strategically placed but they do not echo around the pieced design. Does it make sense?? 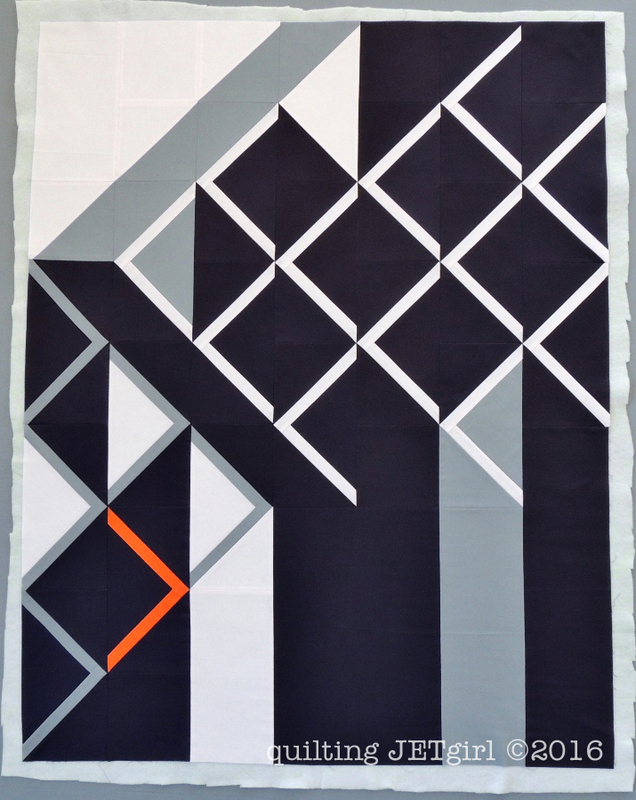 For this quilt I’d use the lone orange arrow/triangle as a ghosting shape, or use the secondary larger arrow/triangle shape you’ve got where the white meets the dark gray and start doing diagonals or crosshatching. I can’t wait to see what comes to you, good luck!